Tax limitation amendments like the Headlee Amendment, Hancock Amendment and Proposition 13 are more frequently studied under the heading of “tax and expenditure limitations,” a category that includes limitations on taxes, revenue, spending or some combination of these. Such TELs, according to the National Conference of State Legislatures, exist in 30 states. TELs can be present in state constitutions or statute or both. A review of the existing literature on STVRs and TELs reveals mixed conclusions — not uncommon on any particular topic in academic journals. [†] The literature on both types of tax limitations is discussed here for two reasons. 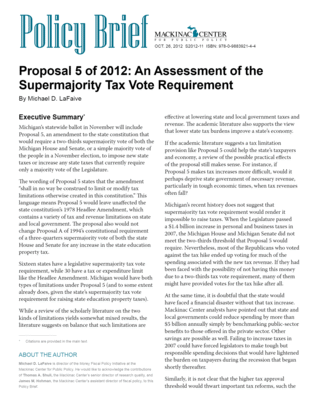 First, Michigan’s Constitution already possesses both a TEL in the form of the Headlee Amendment and an STVR in the three-quarters supermajority vote requirement to raise the state education property tax. Second, both restraints effectively raise the transaction cost to public officials of expanding government by making it more difficult to increase taxes, revenues or both. The effectiveness of one may represent subsidiary evidence of the effectiveness of the other, especially since some TELs, such as California’s Proposition 13, include an STVR. In a 2007 Rockefeller Institute Policy Brief titled “The Effects of State-Level Tax and Expenditure Limitations on Revenues and Expenditures,” authors Suho Bae and Thomas Gais attempted to estimate the spending impact of TELs at the state and local levels. To do so, they employed data on 50 states from 1977 to 2000 regarding state TELs and revenue and spending levels. They controlled for complicating variables (such as state personal income) that might influence government spending independent of the TELs. They found based on their regression work that the “presence or absence of a TEL” affected state and local government spending, and that states with the strictest TELs had the largest decline in spending. A 2001 paper on TELs by Michael New, a scholar with the Cato Institute, dovetails with the Rockefeller Institute study. New created a statistical model based on data obtained from 49 of the 50 states from 1972 through 1996. In his analysis, he attempted to tease out the impact that TELs have on per-capita state and local spending. He found that if a state adopts a restrictive TEL (such as TELs that link spending to population and inflation), the state may see a decline in state and local expenditures of almost $115 per person. This figure is remarkably close to the lower bound associated with the stricter TELs in the Rockefeller study. New also observed, “TELs passed by initiative are more restrictive and contain fewer loopholes than those enacted by state legislatures.” This is not surprising, since TELs passed by a legislature can be changed by legislators whenever they find the tax or spending constraints problematic. In addition, lawmakers are typically lobbied by special interests seeking subsidies, tax breaks or spending increases on particular government programs. Constitutional limits, in contrast, cannot be so easily revised. Moreover, a citizen initiative may be a function of disenchantment with government[‡] or its taxing and spending policies. As Edward Hill et al. of Cleveland State University summarize in a 2006 paper on TELs: “Tax and expenditure limitations are generally the result of voter dissatisfaction with the cost of state government. The public finance environment has experienced two discernible waves of tax limitation efforts, the late 1970s and the early to mid 1990s. In both eras, dynamic individuals dedicated to reducing the size of state government led citizen tax revolt efforts.”[§]  In a political environment of “tax revolt,” policymakers are probably more cautious about raising taxes and spending. There are relatively few papers dedicated solely to STVRs, but economist Brian Knight’s 2000 paper, “Supermajority Voting Requirements for Tax Increases: Evidence from the States,” is often cited. Knight attempted to measure the impact that STVRs have on state tax burdens. He observed that adoption of supermajority requirements by states predisposed to enthusiasm for taxes may cause the full effect of such requirements to be masked. He developed a model to correct for this possibility and — after running three versions of his model — found that supermajority requirements may cause a decline in tax rates of between 8 percent and 23 percent. Meagan M. Jordan and Kim Hoffman, while recognizing Knight’s work, come to a different conclusion in a 2009 paper. To prepare their own analysis, they collected revenue data from 49 states from 2000 to 2006 and statistically controlled for a variety of other variables, such as state unemployment rates, per-capita income, etc. They concluded that the existence of an STVR did nothing to stem growth of revenue. In a similar vein, a 2006 article in the journal Public Choice looked at STVRs and found they have “little effect” on government revenues and spending. The article, authored by John Bradbury and Joseph Johnson, found that supermajority vote requirements were, however, associated with a 7 percent decline in welfare spending. In a 2003 study, scholars Timothy Besley and Anne Case examined the political economy of several policy choices based on “institutional rules” such as TELs. One of their estimations “suggest[s] that state tax revenues per capita — and income tax revenues in particular — are significantly lower in states that have citizens’ initiatives.” Their review of the literature likewise is mixed, but generally suggests that STVRs and TELs work, to varying degrees, as advertised. An exhaustive literature review of STVR- and TEL-related topics is beyond the scope of this Policy Brief. On balance, however, the literature indicates that TELs and STVRs do, to one extent or another, have the effect of lowering taxes and spending. [*] If Colorado is included, the count would be 17; see the notes for Graphic 1. [†] Scholars frequently review different datasets, construct divergent analytical frameworks and employ a variety of statistical techniques. Article 9, §§ 25-34 was presented to the voters under the popular term “Headlee Amendment,” named after its original proponent, Richard Headlee. It was proposed as part of a nationwide “taxpayer revolt” in which taxpayers were attempting to limit legislative expansion of requirements placed on local government, to put a freeze on what they perceived was excessive government spending, and to lower their taxes both at the local and the state level. See Durant v State Bd of Educ, 424 Mich 364, 378 (1985). [§] The authors appear to have excluded the tax and expenditure limitations of the early 1930s.